Wreathes. I love wreathes. I wish I had more places to hang them around my home. I usually do one on my front door, one in my dining room window, and one somewhere in my living room. Last year I had one hanging from an old window frame on my fireplace mantel. This year I wanted to do something different though. 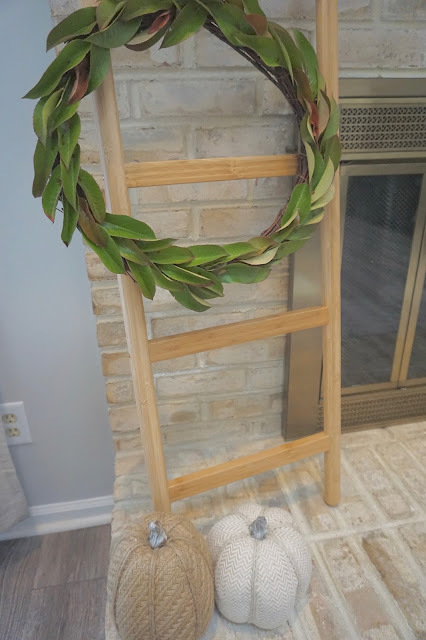 I saw a post on Pinterest with a wreathe hanging on a ladder and I fell in love. I already had the ladder, all I needed was the wreathe. leaves from a craft store) Long oval shaped ones work the best. 1. 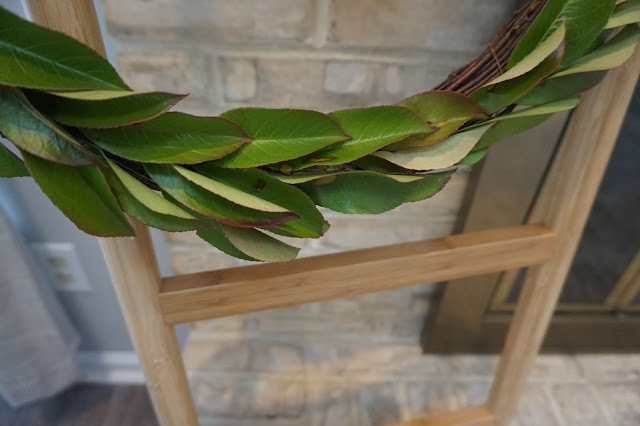 Gather enough stems/branches with leaves to cover your wreath base. I used about 70 leaves for mine. You can purchase a larger/thicker wreathe base, but you will need more leaves. Take the leaves off of the stems. 2. Decide which way you want your leaves to go and start gluing them on. I did one in the middle and one on either side angled out a bit. The shape of the three leaves resembled a birds foot (if that even makes sense). Follow that pattern all the way around, till you reach where you started. 3. Thats it! Super easy, right? You can go back around and place individual ones in where spots look a little bare. Finally, tie some string around the base so you can hang it!! Hope you enjoyed this project!! Stop back tomorrow for my next project that I am sharing!